A stunning debut from a talented new Australian voice in historical fiction. Valentina Yershova's position in the Romanov's Imperial Russian Ballet is the only thing that keeps her... read more from the clutches of poverty. With implacable determination, she has clawed her way through the ranks to soloist, utilising not only her talent, but her alliances with influential rich men that grants them her body, but never her heart. 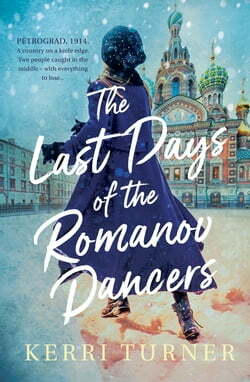 When Luka Zhirkov – the gifted son of a factory worker – joins the company, her passion for ballet and love is rekindled, putting at risk everything that she has built. For Luka, being accepted into the company fulfils a lifelong dream. But in the eyes of his proletariat father, it makes him a traitor. As war tightens its grip and the country starves, Luka is increasingly burdened with guilt about their lavish lifestyles. While Luka and Valentina's secret connection grows, the country rockets toward a revolution that will decide the fate of every dancer.